Zamberlan’s 1014 Lynx Mid GTX was designed after their most popular boot, the 996 Vioz GTX. Featuring a unique camouflage pattern, the 1014 Lynx delivers outstanding comfort, fit and performance on a relatively lightweight but extremely stable platform. The Lynx Mid is built for stealthy performance out on the mountain. Camouflaged Zamberlan Vibram® 3D outsoles are extremely rugged, provide excellent grip on a variety of terrain, and are highlighted by an uplifting forward rocker with solid downhill braking. Dual-density midsole PU, TPU stabilizers, and Vibram’s premiere backcountry rubber compound are durable, relatively lightweight, and battle tested. The uppers feature Zamberlan’s latest leathers with a unique camouflage blend to enhance your entire hunting experience. Gore-Tex® Performance Comfort membranes guarantee waterproof protection and breathability for the life of the boot. Microtex® collars wick moisture from around the lower leg and reduce leg abrasion for greater comfort. The ZFS (Zamberlan Flex System) allows the upper to break forward comfortable without compromising lateral support and protection. Zamberlan Men’s 1014 Lynx Mid GORE-TEX® Hunting Boot – The Lynx Mid was built to provide outstanding performance out on the mountain. Camouflaged Zamberlan Vibram & regular 3D outsoles are extremely rugged, provide excellent grip on a variety of terrain, feature an uplifting forward rocker and solid downhill braking. Dual-density midsole PU, TPU stabilizers, and Vibram’s premiere backcountry rubber compound are durable, light on your feet, and built for ultimate performance. Is the trademark internationally recognized for quality, durability and high performance rubber outsoles. This is the trademark registered by Zamberlan to identify only the best quality leathers, which are tanned following a special treatment that enhances the water-repellence, resistance and durability. Zamberlan`s special construction and design method, combined with the best components to optimize comfort and breathability. Boots crafted accordingly are extremely light weight and very breathable! Zamberlan Backpacking Last, features a wrapping toe, slightly lower instep, lower overall volume, tighter heel lock area, and a roomy toe area to wiggle toes. Zamberlan Wide Last, features a rounded toe, higher instep, superior overall volume, wider heel lock area, and a roomy toe area to wiggle toes. 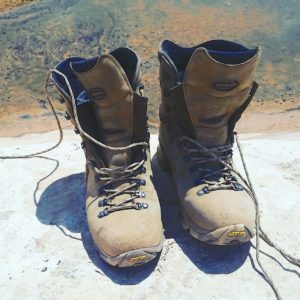 Zamberlan has long been recognized as one of the premier boot makers in the outdoor market today and are continually raising the bar in a very “competitive arena.” That’s why, as a wild sheep guide/outfitter, I demand the highest quality in the footwear I choose to help me navigate safely through extreme terrain and conditions. When I looked at Zamberlan’s new mid-height camo colored Lynx GTX featuring many of the outstanding technical features on their best selling Vioz boot I knew I had to try them out. Wow, I couldn’t believe how light, comfortable and stable the Lynx felt right out of the box. For my feet, this boot fit perfectly. This model met every expectation I had for my early season scouting and desert backpack trips. 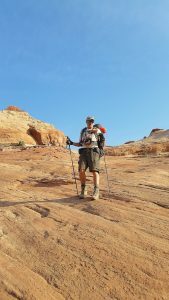 On one trip in August I covered over 30 miles in some difficult sandstone country looking for desert sheep. The hot weather was miserable but the Lynx performed like a true champion. I was extremely pleased with the traction these boots gave me as well as the stability packing a heavy load. Zamberlan’s Nubuck Uppers Are Tough! When I first looked at these boots I was a little concerned that they did not feature a rugged rand. However, the tough Zamberlan HydroBloc Nubuck Upper Leather was amazingly tough. As I’ve discussed, the boot is very comfortable and light on your feet. Many of the new hiking boots on the market today are very rigid. In my opinion that feature can sometimes translate into catching on rocks. 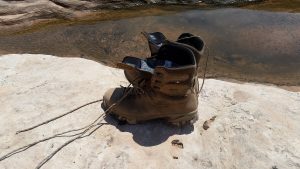 I didn’t find this happening to me with the Lynx GTX as they were not only flexible but enabled my feet to move smoothly over sharp rock or abrasive sandstone yet provided me with outstanding protection. Zamberlan’s Vibram Star Trek soles feature their amazing dual-density PU construction (one for comfort, one for support), and a TPU stabilizer for superior downhill braking. To my satisfaction I find that these soles cling to the steep sandstone formations I do much of my hiking in. With Zamberlan’s “toe climbing zone,” I haven’t experienced any sore toenails yet in my Lynx GTX boots.! The 2.4/2.6 mm Hydrobloc Tuscan Nubuck leather uppers have given me the protection I must have from cactus spines and jagged rocks. In addition the Zamberlan air system engineering allows my feet to breath. This feature is critical to the welfare of my feet since I also hike in some very hot conditions. The 104 Lynx GTX’s have performed well as my feet have not “overheated” nor did they sweat excessively. I chose the mid height Lynx GTX because much of the terrain I spend my time in is on broken, uneven loose rocky slopes where it is easy to sprain an ankle. This height is perfect to provide my ankles with the support I expect and need as I can tighten up the collars on my Lynx boots without any discomfort. I will not recommend the purchase of a boot unless they have met my expectations. I have no problem in “stamping” the purchase of Zamberlan’s 1014 Lynx GTX boot to early season hunters or for backpackers who are looking for comfort and stability. I’m confident that you will find this boot to not only be tough and durable but extremely comfortable. Priced from $340 to $360 in various outdoor stores on the internet this boot is worth the price. Yes, quality boots are expensive but Zamberlan’s quality and durability are justified and when you compare with other brands they are a great buy. You should expect these boots to hold up under the pounding you give them with countless hunting trips under your belt. You can count on the Lynx 1014’s to get you on and off the mountain when you need them the most. Prospective purchasers should also note that Zamberlan will stand behind their product and guarantee’s satisfaction with every purchase. Returns are subject to normal usage. If their boot does not meet your expectations during its useful life, they promise to repair it, replace it, or provide you with a refund. This is very important to me. 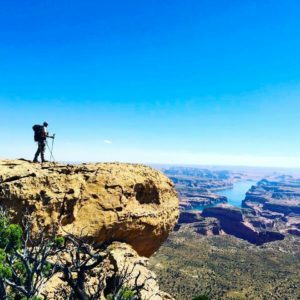 The companies that I purchase my hunting or backpacking gear from have always been very willing to take care of a problem when I phone them personally. 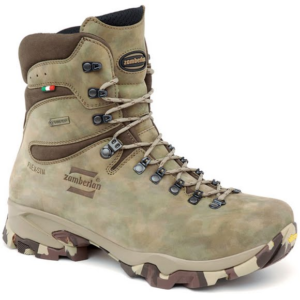 Zamberlan is noted for manufacturing outstanding boots and their 1014 Lynx GTX fits into their reputation for excellence. My only recommendation for this boot is that I would enjoy seeing a tough rubber rand added. With every one of my boot reviews I encourage high end boot companies to all provide better, quality insoles.